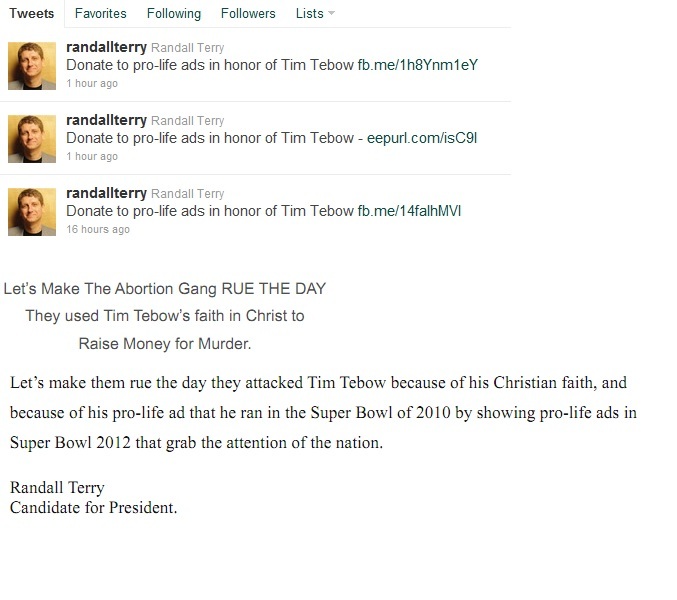 Will Eric Bolling Condemn Radical Anti-Abortion Randall Terry For Using Tim Tebow To Raise Money? After a pro-choice blogger suggested that contributions to pro-choice organizations be made after every Tim Tebow touchdown, Fox's Eric Bolling (who must be very holy because, according to his Twitter, he attends church every Sunday) erupted in rage. He said it was "disgusting" that a pro-choicer would use Tim Tebow. Flash forward a couple of weeks and radical anti-abortion jihadist Randall Terry is using his twitter and a newsletter to raise money for graphic anti-abortion ads to be played during the Super Bowl. Terry, who is challenging Barack Obama for the Democratic nomination for president, is exploiting FCC rules that prohibit censorship of "political" ads within 45 days of a primary. The markets that Terry is buying have primaries in that window. The ads will feature the usual dubious photos of alleged aborted fetuses which are standard props in the anti-choice street theater outside women's clinics. Will Eric Bolling condemn his fellow Catholic (Catholic and other anti-choice websites are praising Terry) for using Tim Tebow? Bueller? Anyone? Visitor: IOKIYAR… the right can use children as props as much as they want. I’ve actually been surprised at how many people are insulted by Tebow’s god-boy antics. I’m thinking that Tebow and Randall Terry just may be energizing the wrong group of people…….us. If Tebow is indeed in the closet, some say that a contribution to AIDS research might be more appropriate.